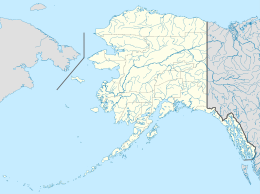 Unalaska (Aleut: Nawan-Alaxsxa) is an island in the Fox Islands group of the Aleutian Islands in the US state of Alaska located at 53°38′N 167°00′W﻿ / ﻿53.633°N 167.000°W﻿ / 53.633; -167.000. The island has a land area of 1,051 square miles (2,720 km2). It measures 79.4 mi (127.8 km) long and 34.7 mi (55.8 km) wide. The city of Unalaska, Alaska, covers part of the island and all of neighboring Amaknak Island where the Port of Dutch Harbor is located. The population of the island excluding Amaknak as of the 2000 census was 1,759 residents. Unalaska is the second largest island in the Fox Islands group and the Aleutian Islands. The coastline of Unalaska is markedly different in appearance than other major Aleutian Islands, with innumerable inlets and peninsulas. 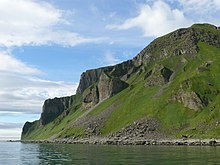 The irregular coastline is broken by three long deep bays, Beaver Inlet, Unalaska Bay, and Makushin Bay, as well as by numerous smaller bays and coves. Unalaska's terrain is rugged and covered with mountains, and during the greater part of the year the higher elevations are covered with snow. 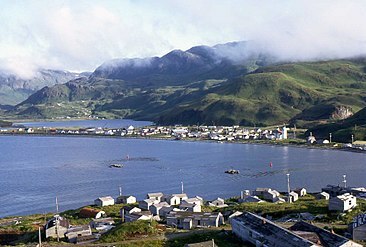 Unalaska is the Aleut name for the island. Several theories about its origin exist; the most likely is that the name comes from a corruption of the Russian word Ounalashka from the Aleut word for near the mainland, nawan Alaskax. The island was first seen by westerners in 1741 by Vitus Bering. A Russian settlement sprang up in 1759, but four years later it was destroyed by the Aleuts, together with four merchant ships. The massacre claimed the lives of 162 Russian settlers. The survivors managed to hold their own until 1764, when they were rescued by the Russians. This event triggered bloody reprisals against the natives which cost the lives of about 5,000 Aleuts. 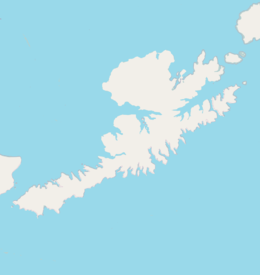 The 1788 expedition of Esteban José Martínez and Gonzalo López de Haro explored the coast of Alaska as far as Unalaska Island, marking the farthest west the Spanish ever explored in the region. Also in 1788, English explorer James Cook visited the island, and spelled it Oonalashka in his journal. In Moscow on May 31, 1988, President Ronald Reagan mentioned the meeting of Americans and Russians on this island in the 19th century as an example of early US-Russian friendship. On December 8, 2004, the Malaysian cargo ship Selendang Ayu ran aground off Unalaska Island, causing a large oil spill. Unalaska provides the backdrop for Cindy Dyson's novel And She Was, recalling much of its rich Aleutian history. ^ a b Bergsland, K. (1994). Aleut Dictionary. Fairbanks: Alaska Native Language Center. ^ Hayes, Derek (1999). Historical Atlas of the Pacific Northwest: Maps of exploration and Discovery. Sasquatch Books. p. 67. ISBN 1-57061-215-3. ^ Encyclopædia Britannica Third Edition, 1797 Volume 13 article Oonalashka, and Volume 5 article Cook, James. ^ Dyson, Cindy (2005). And She Was. New York: HarperCollins. ISBN 978-0-06-059770-2.